Over the last decade I have become quite familiar with the flora of western New York. I love and adore the species that call my neck of the woods home. For this reason, I get extra excited when I encounter something new. Identifying a plant I have never seen before is one of the best parts about botanizing. Having that species represent a family of plants entirely new to me is truly the icing on the cake. Bogs are some of my favorite habitat types. Their complexity in structure is well complemented by the myriad species that haunt the soggy terrain. They are made all the more wonderful when you consider their age. Bogs are glacial relicts, having existed unchanged since this region was freed from its icy grip. On a recent bog slog something different caught my eye. What appeared to be an odd clump of grass quickly revealed itself to be something new and different. Sitting atop some of the blades were leathery clusters of bracts. Poking out from between these bracts were little yellow tufts. A closer inspection revealed that these tufts were three delicate petals of a flower unlike anything I was familiar with. 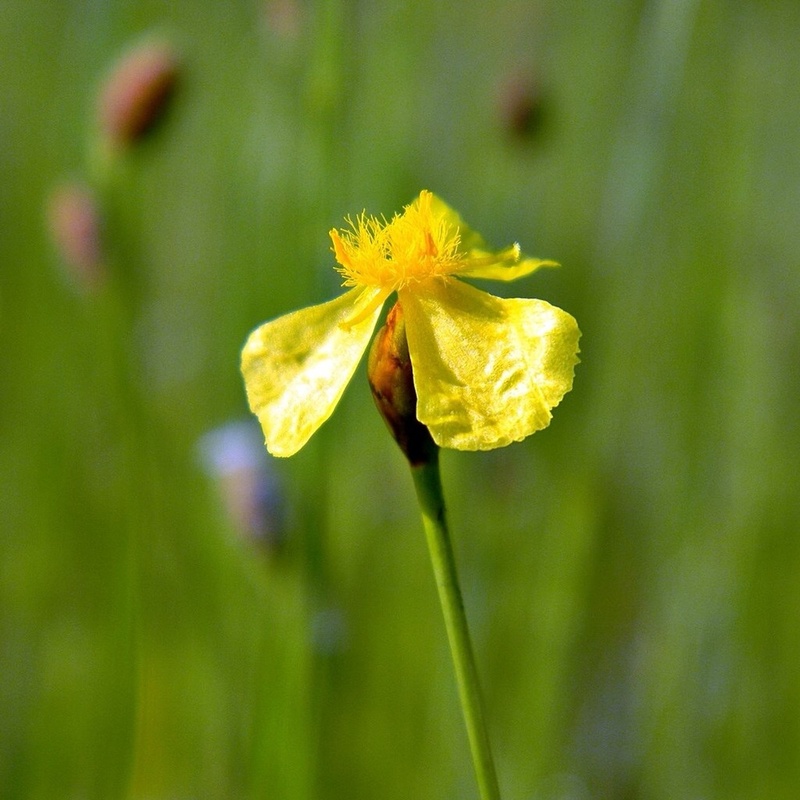 Field guides were consulted and this odd little plant turned out to be a member of the group commonly referred to as yellow-eyed-grass. My first thoughts on this went immediately to the genus Sisyrinchium, those not-so-iris-like members of the iris family. Though they are similar in appearance, the yellow-eyed-grasses are not related to blue-eyed-grasses at all. Yellow-eyed-grasses not only belong in their own genus - Xyris - they also belong in their own family - Xyridaceae. They are more closely aligned with grasses than they are other flowering plants. There are something like 5 genera nestled into this family but a majority of the representatives belong in the genus Xyris. The plant I had found was Xyris difformis, the bog yellow-eyed-grass. 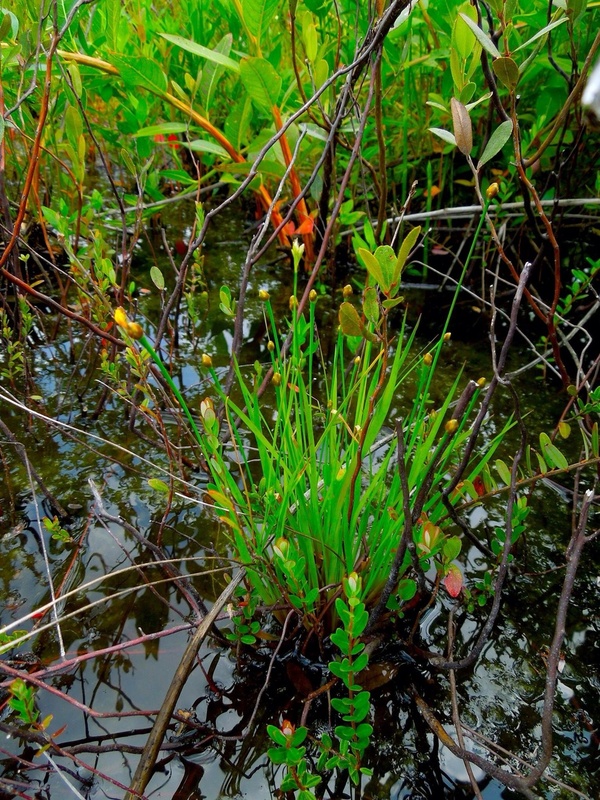 They are plants of wet places, specializing in wetlands, bogs, and shorelines. Their ecology is interesting in that they sort themselves out along wave gradients, with most species preferring enough wave action to provide the proper soil texture and to limit competition from other wetland plant species. This group is incredibly interesting. They are also quite beautiful. Some species are becoming rare in North America as we continue to turn wetlands into housing developments and strip malls. With a global distribution, many of you are likely to encounter a member of Xyridaceae in your neck of the woods as well. Simply keep you eye open for any strange "grasses" growing in wet areas.